There is always a Triskell partner ready to help you. Contact us to get the partner closest to you. Added Value Partner for Valuable Customers. P3M Partners has been delivering market leading PSA, EPM and PPM software and services since 2003 from its headquarters in London through a multi-lingual team of highly experienced industry experts across the globe. P3M Partners team is made up of individuals possessing a huge amount of directly relevant technical and business experience. P3M Partners has business/functional consultants with specialist skills in areas such as financial management, resource management and project management, together with technical and development experts with all the necessary skills to deliver a range of software infrastructure, customisation, integration and reporting services. The Soluster team have managed more than 200 project portfolio management systems deployment to date. Whatever type of project, R&D, IT or PSA you may have chosen, and whatever methods you might be using, our consultants can help you put in place and optimise your processes. They are familiar with most of the standard project management tools : PMI, Agile, Stage Gate , Prince 2, Scrum. More than 200 companies have benefited so far from our expertise in implementing project management systems, from SMEs to large international companies. myAMS is a distribution partner for software publishers wishing to develop quickly on French-speaking territories and increase their market share. Unlike most service providers, we are 100% oriented on software products and solutions for organizations. myAMS has a dedicated pre-sales and engineering team as well as a team of technical experts. We work with qualified and certified partners for implementation projects. At myAMS, we offer our software distribution expertise and especially our customer base to validate your solution on the French-speaking market. We also ensure the associated distribution service setup: marketing actions (lead generation, press contact…), pre-sales, contract operations, support and training. Created in 2010 by 3 partners with over 60 years of experience in software publishing, myAMS is a private company whose head office is located in Boulogne-Billancourt (92), France. Easis is an independent consulting company founded in 2007 and based in Paris. Our value proposition combines innovation, modelization and transformation to lead projects in complex and ever-changing environments. Easis brings expertise in Portfolio & Project Management, Enterprise Architecture and change management through a « 360° vision » addressing processes & practices, organization & governance, tools & technologies. Easis has been Triskell Gold Partner since 2015. With a team of 20+ consultants and half focused on Portfolio Management, Easis has implemented more than 20 Triskell projects for companies like AG2R La Mondiale, AXA, Bouygues, Crédit Agricole, La Banque Postale, Limagrain, Harmonie Mutuelle or Vinci. Easis has proven its value for Triskell clients by building stakes-centric solutions. Easis agile implementation methodology aims to quickly deliver contextual, highly scalable and progressive solutions focused on use-cases and users adoption. KFA is a consulting firm specializing in IT project management. KFA has been leading PPM/EPM projects for the past twenty years in France, in Lebanon and in Dubai. The company has a proven experience in IT project management in various business areas : banking-insurance, retail, telecom, energy, pharmaceutical and public administrations. Cost House Middle East Africa is a consulting firm specializing in value performance. Cost House MEA is based in Casablanca (Morocco) and is part of Cost House Group based in France (Paris and Lyon), Brazil and Switzerland. They advise executives from Finance, IT, Procurement, R&D, Production, Marketing and Sales, helping them improve on the following: Costs, Time and Value. Cost House has developed three areas of expertise: Costing, Competitiveness improvement and Operational strategy. Cost House MEA has strong PPM capabilities in its team and can help organizations to define and support PPM methodology and processes. 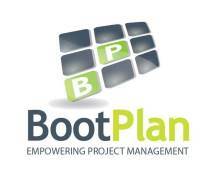 Bootplan’s team is exclusively dedicated to the sales and implementation of Project and Portfolio Management tools. This provides our especialized staff with a strong and deep knowledge on the best market options. We are commited to overcome the hurdles of implementing management tools through modular software,enabeling the quickly configuration and adaptation in a user-friendly way. The approach we propose allows for a strong reduction in costs associated to the installation and Go Live for our customers. We aim at being a business partner that ensures the eficiency and the effectiveness of project and portfolio software implementations.